This is a dream come true and the final part of our 10 year plan to develop a nature information point about nature in general and nature on the Isle of Wight. When complete we will be the only one of it's kind on the Isle of Wight. The grant will be used to build a discovery centre, nature information covering many subjects including identification, habitats, biodiversity, succession and where else on the Island you can go to explore nature. 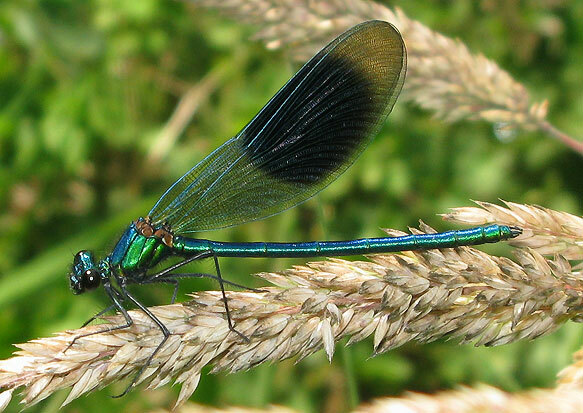 We were awarded a grant from Awards for All earlier this year (July 2018) to develop a Dragonfly Discovery Centre. Plans are well under way. We have laid the foundations, organised information panels and two schools to participate in an art project. Volunteers will build a wooden pergola that will house masses of information about these amazing insects. Fossils show that they are one of the oldest and largest insects to have lived on this planet some 300 million years ago. A local primary schools will be creating a frieze of terracotta tiles depicting dragon flies and another primary school will be creating cement blocks to be inserted into the concrete floor again with images of dragonflies. We will also be running a competition "Making a Dragonfly from Recycled Materials". Rainwater will be gathered from the roof of the pergola and directed along a rill to the bog area and pond. Come along and watch our progress and even get involved. Make a willow dragon fly, take some photographs. Pond dip and count the number of dragonfly and damselfly nymphs. A chance to see dragonfly nymphs real close up! We aim for a grand opening end of April 2019. We have been awarded £28,000 to help develop our self-funding ambitions. The grant will include advice from experts. Research into other similar organisations, financial support to make us more regularly accessible to the community, set up a young directors scheme and further training for volunteers and session workers. This is a massive step forward for us. it will bring us into the mainstream of The Island's natural history education and give us future sustainability for the posterity of our organisation. We are very excited that the world famous Wild Fowl and Wetland Trust (WWT) will be our main advisors. Project manager Angela Hewitt said "Sir Peter Scott has been the main influence behind the creation of Naturezones and it is a dream come true to be working with the WWT. New Education Centre - The Planning Department have approved our application for a new Education Centre and workshop. This will allow us to run indoor activities, lectures and workshops during the winter. Our normal outdoor activities are still the mainstay of our ethos but this small expansion makes us available to more communities. We now have the grand task of fund raising. Built by D of E Students from Carisbrooke High School as part of their bronze award. We were impressed by the skills of these young people who put a lot of thought into the project. 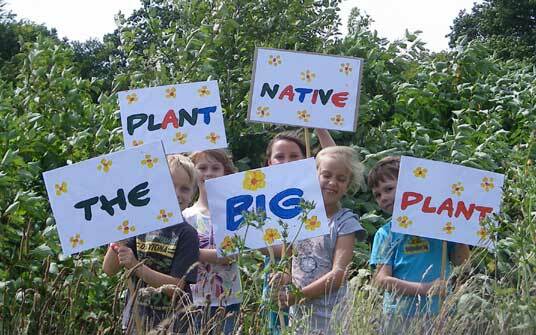 1st June 2012 - The interest in native species plants is finally taking off. We have spent the last 4 years trying to promote this message and thanks to various TV programmes people are finally becoming aware how important it is to provide the right flowers with the right kind of "nectar cup" so that our native insect's proboscis can fit in to consume the nectar. It is this nectar and pollen gathering process that results in cross pollination. Foreign plants are for foreign insects. It all ties in with our "Plant Native" project. We have building up to this project over the past 4 years. It was initially developed with our Heritage Lottery Grant. We are now hoping to be successful in our second bid to carry the project forward. Competition for grants is tough this year so we really are holding our breath. In the mean time we run volunteer days on Wednesday and Saturday and in school projects where we offer a Meadow Making Programme and a Brush with Nature Programme. We are currently preparing for our open day on Wednesday the 4th July. We are aiming the open day at "Transport Greenies" - none car users and small school groups. Teachers are also invited to pop in after school for a cup of tea, piece of cake and a chat. 1st May 2009 - So much has happened since Christmas it is hard to know where to begin. Most importantly we have been successful in being awarded a lottery grant from the Heritage Lottery Fund. This means we are now able to start our Young Meadow Makers project. The grant will cover acquisition of meadow making equipment, setting up an education programme and funding for 60 workshops for people of all ages, but in particular key stage 1,2 school children and college students. There will be more information about our education programme on our web site over the coming months. After the success of last years cornflower field we have re-sown it this year and created a second smaller cornflower field further along at the top of the meadows. Landscape gardener Tom Murphy felled some of the numerous sycamore trees in the woodland creating more light for the under-story of wild flowers to develop. We are lucky to have moschatell growing in the woodland (clock face flower). This wild flower is indicative of ancient woodland and is in a family of its own - so quite unique eh! The bluebells are even earlier this year, in full flower by mid April. Last year they flowered early May and the year before that end of May. Every year is different depending upon the winter rain fall. Some of the I of W college students made a willow arch in the withy bed the catkins will provide early pollen for the bees next year. We spent the Winter working with year 1 and 2 children at St Georges primary school, Arreton, creating a wild flower meadow garden. The project began in January and will continue to November as we take the children on a journey of discovery into the importance of creating food for bees. The project involved lots of outdoor work and several sessions in the classroom where art, identification and crafts take place. The project has covered several sections of the national curriculum in natural sciences and wildlife habitats. Once again the Green Gym visited us armed and ready to help out with our conservation work. They split into teams and spent the morning copping the hazel in one of the compartments designated by our tree felling license. Others cleared the cornflower field, dug up thistles and tidied up the top of the field around the newly planted silver birch copse. We ended the morning with homemade soup, although the weather was hot and sunny considering it was January. Simon Dear from the Duke of Edinburgh Award Scheme visited NZ to present our first participants of DofE award with their certificates. They had completed one of the sections of the Bronze Award for conservation. The 42 trees of different silver birch species ( including:- Betula pendula, Betula papyifera, Betula pubescens, Betula utilis jacquemontii. They all have white bark) will create a fabulous habitat for wild life but will also show people how attractive a copse of trees can be made to look. There is a central area to the copse that has been left unplanted to create a glade. The copse will be under-planted with native species of wild flowers to provide an all year round larder, nectar for insects, and then later seeds for birds and small mammals. After simple instruction on how to plant a small tree all the children got involved in digging the holes, planting the trees and then mulching around the bottom of the trees with hay from the haystack that had been left for the purpose. However, some of the children had better ideas for the use of the haystack. They had great fun clambering up its soft walls to play King and Queen of the castle. The hay stack has been hugely popular with visiting children. So much so that we are going to ensure there is one available every year. They are perfectly safe and always provide a deep cushion landing and impossible to fall off. Every one should have one. We then returned to the Barn for picnic lunch, hot chocolate and activities such as leaf printing and stencilling and nature safari through the wood. 23rd October - Good news! we have been accepted by the Tree Council to take part in National Tree Week 27th November - 7the December. They have given us a grant to plant a small and very pretty silver birch copse. We will be performing this project with 38 children from Arreton Primary School on 3rd December. 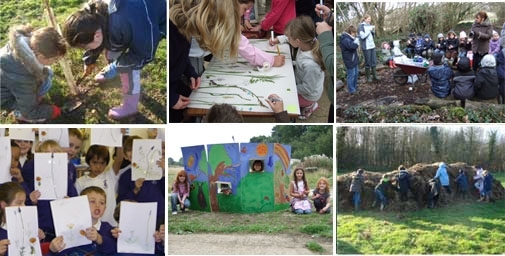 Families wanting to see the results of their work can visit Naturezones on Saturday 8th December 11am - 3pm. Please try and be Green, cycle or walk along the cycle path or catch the No 2 bus to Blackwater. 27th and 28th September - Cultural Olympiad Open Weekend was a huge success. We are delighted to be in partnership with the Quay Arts Centre and Melanie Swans Art group that includes people living with Autuism. Amazingly this is the only group on the Island involved with this important national project. On the 27th everyone met at the Quay Arts centre then on the Sunday Naturezones opened its gates. 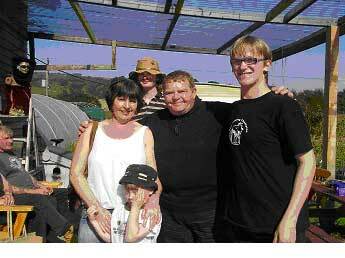 Famous actor Geoffrey Hughes came along to open the event.
. He has a lot of expertise in conservation and woodland management. So his support will be invaluable. 20th September - More good news. The Tree Council have awarded us a grant of £510 to plant a mini Birch copse, this has to be done during National Tree week. The criteria is to involve school children in the project. We have invited Arreton Primary School and Medina House Special School to take part in the two days (3rd and 4th December) of Celebrating Trees. We will be planning lots of tree activities from bark rubbing to hug a tree. 12th September - Exciting news!! Thanks to Melanie Swan, artist, parish councillor and former Isle of Wight County Councillor and cabinet member for children's services, and, dynamic projects leader, we are involved in the Cultural Olympiad which will be running in tandem with the 2012 Olympics www. The title of Melanie's project is "No man is an Island". We will be working with a group of young people on the autistic spectrum creating art and connecting it with nature. This will include photography with a specific 2012 theme and creating living walls and carpets from felt then planted up with wild flowers. This will also be in partnership with the Quay Arts Centre. The open weekend is 27th September (at the Quay) and 28th September (at Naturezones) so please come along. On 17th of September the Education section of the Cultural Olympiad project will be launched at Naturezones 6.30 - 7.30 pm (tea and biscuits provided). What excites Naturezones about this project is the opportunity to talk to a new group of people about the importance of protecting and creating wildlife habitats. 11th September - Having passed all the checks we are now officially Access Providers for the Duke of Edinburgh Award Scheme. We will be offering Skills and Service in Conservation and the Environment. Carol Taverner presented Angela Hewitt with her certificate. We had a group shot with four young people who will be participating. The D of E is open to anyone aged between 14yrs and 25yrs. It is anticipated that they and Two groups of Isle of Wight College students will be involved in our "Young Meadow Makers" project. All we need now is the grant. 22nd July - Naturzones seems to enjoy extremes of wind - we are in a valley, and sunshine. So we have turned one of the polytunnels into a shade tunnel. This has proven hugely successful and the plants propagated by the college students are looking nice and healthy. We used green netting designed for the job and attached it to the hoops using plastic ties. Wind burn and sun burn are now a thing of the past. 20th July Our open weekend was hugely successful and came to fruition with a fund raising supper in the evening. Supporters were given Summer chicken casserole and fruits of the summer jelly with creme chantilly. Provided by Lugley's Tuck Shop. A pre-supper stroll through the meadows and woodland set everyone up for a hugely relaxing and casual evening. So much so that everyone wants to come again. I can see a regular Naturezones supper night under way. Next Supper night will be August 9th @6.30 p.m. Cost £8.00 BYO. 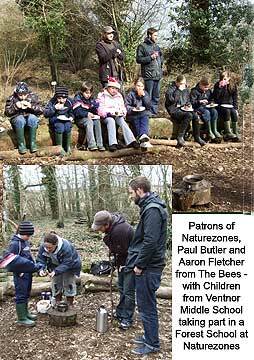 Cheques payable to Naturezones Wildlife Education Trust. 11th July The east side of our seven acre field is over fertile due to the intensively farmed adjacent field. We get the run off from the excessive use of fertilisers. The effect on our field is an abundant growth of unwanted grasses, thistle and dock. To mitigate this we have rotovated a section of the field and sewn it with cornflowers seeds. The result of this "pilot planting" is extremely pretty, corn marigold, corn daisy, corn flower and poppy are all flowering and there is serious promise of an grand flourish of the rare corncockle which we expect to be in full swing by the end of next week. The wind has not been kind to insects but when it drops I expect to see numerous butterflies dancing along the beautiful flower heads. 7th June Eager to discover the movements of wildlife at around the Naturezone's site we have dotted surveillance cameras around the area. We have seen badgers, vixen and cubs, squirrels and a whole range of other interesting stuff including the person who helped themselves to some of our foxglove plants. We are sure this is an over-site and that they have every intention of paying for them (£40.00).We are prepared to wait until the end of the month for a cheque. 14th May It is amazing how from one year to the next the weather can have such a significance on how plants grow. Last year we had a very dry Winter and the buttercups, only flourished along the damp wood land edge of the meadow. This year the story is quite different and a vast abstract tapestry of the egg yolk flowers with their polished petals cover the seven acres. Walking through the meadow two days ago I also noticed that the birds foot trefoil is not only coming up but double the amount to last year. I have got to cut some grassy paths thought the meadow ready for open day and it will not be a nice experience to have to cut some of them down. But it has to be done as the whole point of this project is to allow access to the public on open days. The weather has also had an affect on the bluebells in the wood. last year they were quite late and didn't begin to open until mid May. This year with the wet winter they were earlier and bigger and sadly are nearly over. This is disappointing as I wanted it to be a highlight of our open day. I must keep my eyes open for the creeping (tufted vetch) and kidney vetch. I have also noticed that the swallows are back. They really enjoy swooping across the buttercups seeking out insects. 9th May We are busy planning our open day. it happens to coincide with the Big Green Picnic. As we are on the cycle path from Newport to Merstone we thought it would be a good idea to tie in with their council project but understandably they didn't want to detract the emphasis from their own project. So we have decided to take a stand and tell people they can visit us after they have been to the BGP. 22nd April We had a teachers discussion group. This was hugely helpful. We have already done a risk assessment of the site but their input made a few additions. We also talked about school visits and the themes they would like us the cover. The cost of transport was an issue. The Wight bus for 42 children was £105 for a return trip but Southern Vectis bus company offered the same price for 53 children. per head this is cheaper, However, most schools bring 30 children and do not usually fill the bus. I think we need a mini bus of our own. We can then cover field trips to other projects on the Island. Even trips on the mainland. 7th April - The contractor turned up to install the Diamond tank and soak-away for the toilet block. We had to get permission from the environment agency as it is in a sensitive water extraction area. However I have been told that you can drink the water after it has passed through this special tank. Any volunteers?? 2nd April - The Green Gym visited us and did some constructive work. Clearing up the dead wood and making eco-piles. Clearing out the ditch which has become blocked with dead leaves. Putting in the posts for the withy bed and digging a small area for our demonstration woodland edge garden. about 30 turned up and they worked really hard. We gave then soup and cake, provided by volunteer Wendy, which went down really well. March 2008 three volunteers and two college work-experience student cleared the wood of the mass of rubbish that had accumulated over the years. There was a huge pile. it took four lorry loads to take it all away. However the entrance to the wood is now looking quite smart. Cleared up lots of rubbish and straggly fencing that was littering up the field, but still more to do. Put up a movement sensitive battery operated camera in the wood next to the feeding table. April - Dec 07 - Spent the year watching the land to see what emerged. We were delighted to see, English bluebells, foxgloves, red campion, birdsfoot trefoil, creeping vetch, horseshoe vetch, chamomile. Also, beautifully scented thistles intoxicated the summer air but, just too many of them! Asked Hampshire and Wight Wildlife Trust to do a survey. Asked the Isle of Wight College if they would be interested in being involved in the project. We are pleased to have two groups visiting on Monday and Wednesday. The Wednesday group help with some of the ground work. Pulling out sycamore weeds and plating up plugs. The Monday group are working on craft projects, signs, bat, squirrel and bird boxes (to be installed in may at the open day. We also have a 2nd year horticultural student on work experience from the college one day a week. Asked Hugh Milner from the Forestry commission to pay us a visit and give advice. 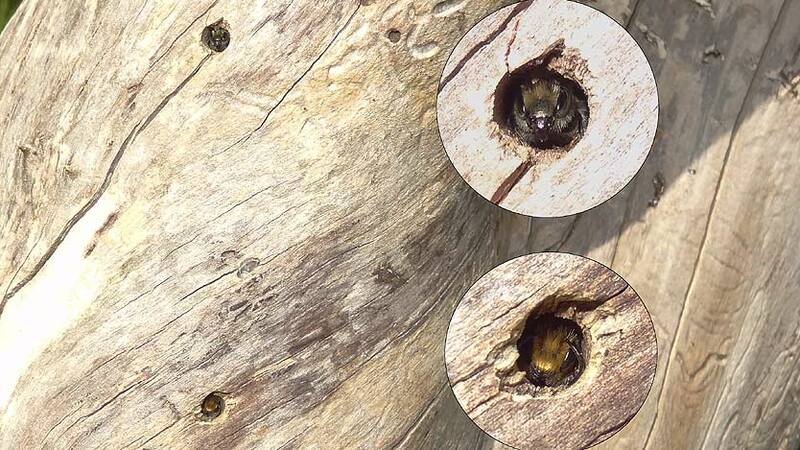 Hampshire and Wight Wildlife Trust designed a woodland management plan to coppice the 3 acre ancient woodland and remove the rampant sycamore trees over a 20 year period. The wood has a tree preservation order so we have got to apply for a felling license. This will be done through the Forestry Commission and the Isle of Wight Council. coppicing of the wood - this is a 15 year programme, cornfield, scraped meadow, withy bed, crab apple copse, silver birch copse, ditch clearance - ongoing, experimental meadows.